After a page is recognized, the recognition results appear in the Text View. All of the non-dictionary words are underlined with red wavy underlines. You can turn off the spell check from General Settings. You can directly edit such words or you can use the built-in spell checker engine. 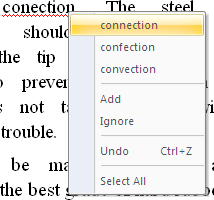 You can choose one of the suggested words and the underlined word will be replaced with the chosen one. To skip the word without making changes select Ignore from the context menu and to place the selected word into the current user dictionary select Add from the context menu, this way the word will not be treated as an error at next use. As Smart OCR performs recognition, it also automatically detects the text and paragraph styles used throughout the document. When you select a recognized text its text and paragraph formatting properties are displayed on the formatting panel of the Text View. Smart OCR allows you to adjust event these styles - just change the displayed properties on the formatting panel or from Text menu and your changes will be applied to the selected text/paragraph(s).